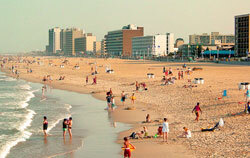 Norfolk's Virginia Zoo (Virginia Zoological Park) is a fun place for kids of all ages. 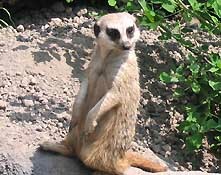 Modern and well kept, the Zoo is just a short drive from anywhere in Norfolk. 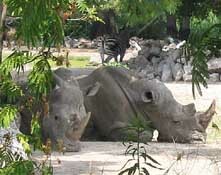 I visited the Virginia Zoo in the early afternoon of a weekday in June of 2004. I was surprised to find hundreds of cars and buses in the parking lot. 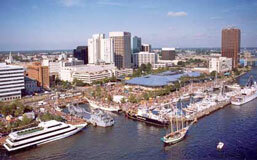 The Norfolk VA zoo is a popular place! The large, attractive headquarters building is also the entry gate and gift shop (no batteries for my camera.) You'll get a zoo map at the entrance. There are two tall observation towers attached to the headquarters building that were obviously meant to provide visitors with a birds-eye view of the zoo ... but chains across the stairs limit access to "staff only". What's up with that? Immediately inside the gate is a broad plaza with several fountains spurting water in the air. The fountains spray up through grates at ground level, so anyone can walk over and get wet. Hordes of kids were getting soaked on the hot day I was there. In fact, there were kids everywhere! Kids in strollers, kids with parents, kids in groups. The Zoo teems with kids. A look at the zoo map found that it's arranged in a big circle. It was very easy to wander around the loop without missing anything. I quickly realized that the mid-afternoon on a hot summer day is not the time to go to the zoo. Most of the animals were napping in the shade. The most active animals (and therefore my favorites) were the bison, zebras, giraffes, antelope and ostrich. 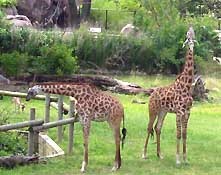 The giraffes, antelope and ostrich are kept together in a large open area. The zebras put on a show by rolling around in the dust. They're kept in the same containment area as the white rhinos, but the rhinos weren't doing much in the heat. There was no sign of the lions (probably sleeping in their den) and the elephants were standing in their building. The tigers were outside, but just snoozing in the shade. Bunches of other animals ... farm animals, reptiles, nocturnal animals, waterfowl, birds of prey, meerkats, bongo, baboons, hogs, eagles, deer, llamas, and emu. The zoo is well landscaped with wide paths and a variety of beautiful theme gardens. There's a fast-food restaurant serving the usual hamburgers and stuff, but I didn't try the food. The Virginia Zoo isn't huge, but it's a fun way to spend a couple hours. I enjoyed my visit and the millions of kids in attendance seemed to have fun too. Go early in the day (be there when it opens at 10 am) and pick a cool day if possible. More things to do in Norfolk. Fountains on the plaza are a favorite play place for kids. Virginia Zoo rhinos snoozing in the shade. 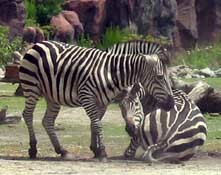 The zebras take a dust bath. Giraffes stayed in the shade, but were still active.